Also returning for the third time is composer Hans Zimmer, who in scoring At World’s End is virtually guaranteed one of the biggest box office hits of his career. Zimmer, as everyone now knows, wrote the scores for both the first two Pirates of the Caribbean movies – Klaus Badelt was credited with the first score for purely contractual reasons – and has now defined the specific ‘sound’ that has permeated the trilogy. Whether or not Zimmer’s scores are appropriate for a pirate epic is now a moot point: Zimmer’s swashbuckling music is about as far removed from that of Erich Wolfgang Korngold, John Debney and the Disneyland ride as it is possible to be, and irrespective of whether you approve of the genre-bending stylistics, one cannot deny its effectiveness. I wrote in my review of Dead Man’s Chest that the general tone of the score is exactly the same as its predecessor: power anthems, thunderous action cues, low male voice choirs, and rousing themes. If you liked either of the first Pirates scores, there is every chance you will have the same feelings for At World’s End. 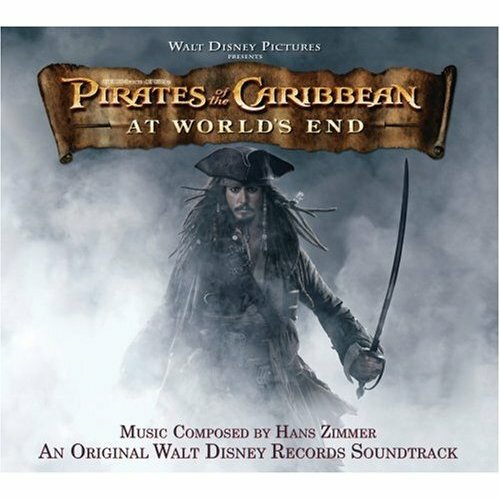 In reality, though, At World’s End is probably the best of the three scores to date, mainly due to the fact that Zimmer occasionally steps out of his POTC comfort zone and writes something fresh and interesting, but also because Zimmer concentrates much more on writing for the orchestra this time around, and more often than not leaves his synths at home. The main new theme of the score is a pseudo-romantic theme for swirling strings which initially sounds like a stowaway from The Da Vinci Code, but eventually develops into a motif for Jack and the crew of the Black Pearl that is malleable enough to appear as an action ostinato, a heroic fanfare, and as a romantic anchor. It first appears during the opening moments of “At Wit’s End”, receives its first heroic treatment in the wonderfully energetic “Up is Down”, transforms into an oboe-led love theme at the beginning of the lovely “I See Dead People in Boats”, and features prominently in the all-inclusive end credits edit, ‘Drink Up, Me Hearties”. The other new theme – a sort of pirate’s anthem – is heard in the opening “Hoist the Colours”, with lyrics performed by a hesitant boy soloist, before being taken up as a dirge by a male choir. It appears in several settings later in the score – as a drunken sounding harpsichord piece in “The Brethren Court”, as a noble and moving call-to-arms in “What Shall We Die For”, and as a choral action theme in “I Don’t Think Now Would Be the Best Time”. In addition to all this, Sao Feng gets his own oriental theme, performed by an erhu and heard in the unusually evocative “Singapore”. “Parlay” is an energetic homage to Ennio Morricone, with wailing western electric guitars underpinned by a driving percussion ostinato. And then, of course, there’s action aplenty, as “At Wit’s End”, “Up is Down” and the absolutely enormous “I Don’t Think Now Would Be the Best Time” unleash gargantuan forces to accompany the epic on-screen battles. The latter cue is especially notable for its pace, volume, and the way in which it maintains intense energy levels over the course of almost eleven minutes. As one would expect, themes and motifs from the previous scores reappear with pleasing regularity this time round. The two jaunty themes for Jack (weirdly deconstructed with harpsichords, jaw harps and metal percussion in “Multiple Jacks”), the dramatic march for the East India Trading Company, the wonderfully ominous pipe organ theme for Davy Jones, the voodoo-inspired vocal work for Tia Dalma in “Calypso”, and a variation on the monstrous guitar-driven ‘biker gang’ theme for the crew of the Flying Dutchman all make prominent appearances. Fans of Zimmer’s style will be delighted to know that the choral content is significantly increased in this score: anyone who’s ever wanted to hear Jack Sparrow’s theme accompanied by a large choir will be delighted with what’s in store here. I’ve read lots of arguments about Zimmer’s perceived negative impact on film scoring in recent years; about how his Remote Control organization stifles creativity, is dominating the market, and about how Zimmer’s ‘one size fits all’ composing technique can be applied equally to films about pirates or gladiators as they can to films about King Arthur or Japanese samurai. And the thing is, I agree with most of the arguments. Zimmer’s highly specific style does seem to have overly-encroached on the film music world, and his crowd-pleasing lack of specificity is arguably harming those composers who take the time and trouble to research the appropriateness of their scores. But, as I’ve said before, when it comes down to it, the Pirates of the Caribbean scores are so difficult to dismiss simply because they are so enjoyable on a pure and basic level. I’ll end the review by asking for a third time the question I asked myself at the beginning of my review of Curse of the Black Pearl back in 2003: how can I, as a “respected” reviewer of film music, give such a high rating to a score which is quite blatantly inappropriate for the movie, predictable to the extreme, and derivative of virtually every major Media Ventures action score written in the last ten years? My answer now, as it was five years ago, is to simply shrug my shoulders, and admit that, once in a while, its OK to stop over-analysing and simply be a film music fan. Music composed by Hans Zimmer. Conducted by Blake Neely and Nick Glennie-Smith. Orchestrations by Walt Fowler, Elizabeth Finch, Ken Kugler, Suzette Moriarty and Steve Bartek. Additional music by Lorne Balfe, Tom Gire, Nick Glennie-Smith, Henry Jackman, Atli Örvarsson, John Sponsler and Geoff Zanelli. Featured musical soloists Phil Ayling, Chris Bleth, Pedro Eustache, Karen Han, Lili Haydn, Michael Levine, Frank Marocco, Heitor Pereira, Simon Phillips, Tom Raney, Martin Tillman and Gore Verbinski. Special vocal performances Dolores Clay, Hila Plitmann and Brendyn Bell. “Hoist the Colours” lyrics by Gore Verbinski, Ted Elliott and Terry Rossio. Recorded and mixed by Alan Meyerson and Slamm Andrews. Edited by Melissa Muik. Mastered by Patricia Sullivan. Album produced by Hans Zimmer, Bob Badami and Melissa Muik. Jonathan, you were holding back when you say ‘Parlay’ was merely a homage to Ennio Morricone. It is of course, but more specifically it’s a homage to Once upon A Time in the West. Still, great score nevertheless. Just catching up on some Hanz Zimmers after what I consider the best film score for some time, The Lone Ranger. A cd I simply can not stop listening to.